Kuwait is just smaller than New Jersey. Its key geographic feature is Kuwait Bay, a sheltered harbor with almost half the country’s 120 miles of coast on the Persian Gulf. It has a well accepted 155 mile border with Saudi Arabia and a 150 mile contested one with Iraq. 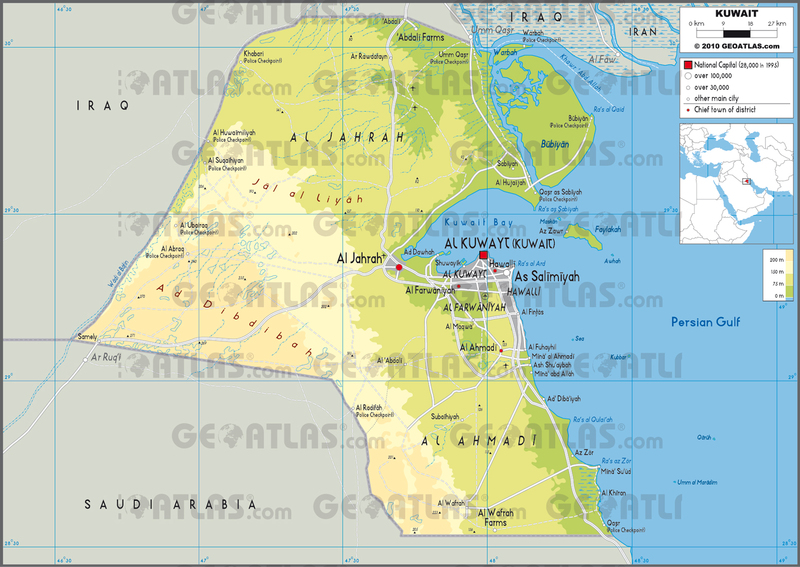 Less than 1% of Kuwait is arable land and 90% of the population lives around the Kuwait Bay. Kuwaitis make up only around 30% of the 4.1M population, which also includes 1.1M Arab expatriates and 1.4M Asian expatriates. Most of Kuwait’s citizens are Muslim, an estimated 60%–70% Sunnis and 30%–40% Shias. Kuwait’s strategically located deep water port has since ancient times been important for trade. It was colonized by Greece, fell to the Persian Sassanid Empire, then to a Muslim Caliphate in 636 AD, to a kingdom in Iraq and in 1521 to the Portuguese. Then Arabs moved in from Saudi Arabia and took control. The king who established Kuwait’s dynasty declared allegiance in 1752 to the Ottoman governor of Iraq. Kuwait was then nominally governed from Basra in southern Iraq. In practice, it was largely autonomous. It took over much of the trade that passed through Basra when that city was attacked by Iran from 1775-79 and quickly became the primary center for shipping between Arabia, Iraq, Syria, East Africa and India. Ships made in Kuwait carried most of the area’s trade from the late eighteenth through the nineteenth century. Kuwait’s borders were defined in 1913 when Britain made an agreement that it was part of the Ottoman Empire. It encompassed all land within about 110 miles from the capital. Britain confirmed that definition in 1922 when it controlled Iraq. Limiting Iraq’s access to the Persian Gulf to about 35 miles of swampy coastline made it almost impossible for Iraq to become a naval power. Iraq gained independence from Britain in 1932. In 1938 it asserted a claim to rule Kuwait, and although it formally recognized the existing border in 1963, it continued to press for control over Bubiyan and Warbah islands through the 1960s and ’70s. In August 1990, Iraq invaded and claimed all of Kuwait. The UN restored its independence the following year and a UN commission reconfirmed the border, but Iraq did not accept the result. Kuwait’s economy was devastated in the first half of the 20th century by a British trade blockade when Kuwait supported the Ottoman Empire in WW1, then by a Saudi Arabian trade blockade from 1923-37 whose aim was to annex Kuwait, and also by the Great Depression which drastically cut European demand for goods shipped via Kuwait from India and Africa. Kuwait’s king in 1896 was assassinated and replaced by his half-brother. When his brother’s former allies got Ottoman backing he asked Britain for naval support. They agreed, seeing it as an opportunity to counter German influence in the region. In 1899 Kuwait pledged never to cede territory without Britain’s consent, which gave Britain control of Kuwait’s foreign policy and security. Kuwait was saved by British forces when it was invaded by Saudi Arabia in 1919-20. Britain redefined its border with Saudi Arabia after that at a conference where Kuwait had no representative. Although Saudi Arabia got more than half Kuwait’s former territory, they continued their economic blockade and intermittent raiding. Kuwait’s large oil reserves were discovered in 1937 but exploration was delayed by WW2. When oil exports began in 1951, most Kuwaitis were still impoverished. A major program of public works was begun almost immediately and by 1952, Kuwait was the largest exporter of oil in the Persian Gulf region. That attracted many foreign workers, especially from Palestine, Egypt and India. The royal family’s rule had been relatively limited up until WW2 but oil revenues eliminated their financial dependency on merchants who had always been Kuwait’s primary source of income. Oil now accounts for nearly half of GDP and 94% of export revenues and government income. Kuwait gained independence from Britain in 1961 and became the first Gulf country to establish a constitution and parliament. It embraced Western liberal attitudes and most Kuwaiti women did not wear the hijab in the 1960s and ’70s. It consistently ranks as having the freest media in the Arab world, outranking Israel since 2009, and is the only Gulf state ranked even “partly free.” Its legal system is mostly secular with separate family law for Sunni, Shia and non-Muslim residents. Kuwait supported Iraq in its 1980-88 war with Iran but refused to write off the $65B of loans it had made. Then came economic rivalry after Kuwait increased oil production by 40%, and in 1990, Iraq claimed Kuwait was stealing oil by slant drilling into its Rumaila field near the border. Iraq attempted to annex Kuwait later that year. 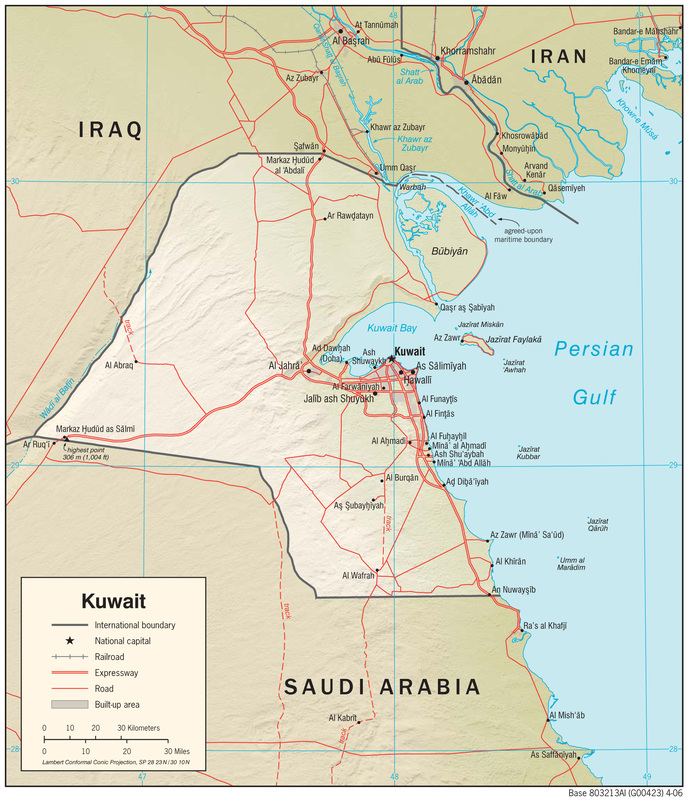 Before the 1980-88 Iran-Iraq war, Kuwait was the Gulf’s only pro-Soviet state. Its relationship with the US had been strained ever since independence in 1961 and it refused to allow USA military bases in 1987. But now, since Iraq’s 1990 invasion, the US has 10,000 soldiers based in Kuwait. I knew nothing about Iraq or Kuwait at the time of that invasion. I supported the US-led response to what I accepted as a war of aggression. Now I’m not sure what I think. Kuwait does not have the geography of a state. It is tiny and lacks natural borders. Its borders were defined arbitrarily by Britain. Until Britain gained control, it was governed from Iraq. Iraq’s desire for it as a deep water port on the Persian Gulf makes sense. But Kuwait’s government has been pretty good for its citizens, enormously better than Iraq’s, or Saudi Arabia’s.